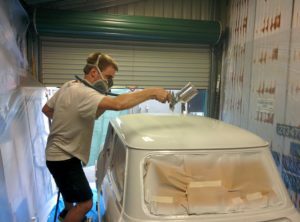 Our Builds Glass 4 Classics owners are hands on classic car builders. Grown from our own love of classic cars. 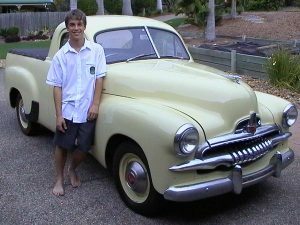 Our 1953 FJ Holden Ute. shortly after we purchased it. Nathan at age 16 is proudly standing with it. Rod & Nathan are both passionate car builders. Liking nothing more than to get down to the shed and work away on their beloved classics. They are the proud owners and have a soft spot for the old Holdens and have a 1953 FJ Holden Ute as well as a 1964 EH Holden sedan in the shed. A more recent and meant to be quick restoration job is the 1970 Morris Mini. Truth be told the FJ Ute was purchased for Nathan as his first car. Being fresh blood to the classic car game, it turned out to be an expensive learning curve. Upon bringing the ‘humpy’ home and getting it up on the hoist, it revealed a crippling rust problem that had been simply covered up with cardboard and sound deadener, in place of proper rust repairs. A story known all too well to many of you out there. The ‘humpy’ has had all the repairs made to it, but has been sitting for a number of years now, waiting for when we can give this old girl the love and attention she needs. Both of us have worked on Nathan’s EH, however, Rod felt that he needed a smaller project, one that could be completed and enjoyed in a much shorter time span. Enter, the 1970 Morris Mini! This project is into it’s fifth year. So much for a quick project, but is one that we are both very much looking forward to completing, hopefully over the next twelve months. Nathan’s 1963 EH Holden Special sedan. 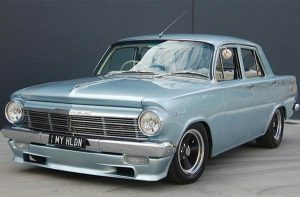 Nathan is the proud owner of a 1964 EH Holden Sedan which boasts a 440HP, 350 small block Chev and has been extensively modified. While we did work on the car quite substantially when we bought it, it was still never quite what we were after. When the tired motor that was in it finally died, we took the opportunity to start from scratch. This meant taking it down to bare metal and commencing extensive body modifications. Time is something that with work being so busy lately and other life commitments, we don’t have a lot of. So we aren’t working on the cars near as much as we would like. However as we do get some work done on them we will be sure post some photos in the gallery for those who may be interested.